Today I wanted something simple for lunch and after doing the rounds of some of my favourite vegan bloggers I came across Maple Spice's recipe for Mushroom Pasta. Her photographs wanted me to cook and eat it straight away. I just wish she had been in my kitchen making it for me herself! I still feel pretty lousy and having my own personal chef would have been perfect, but no such luck! 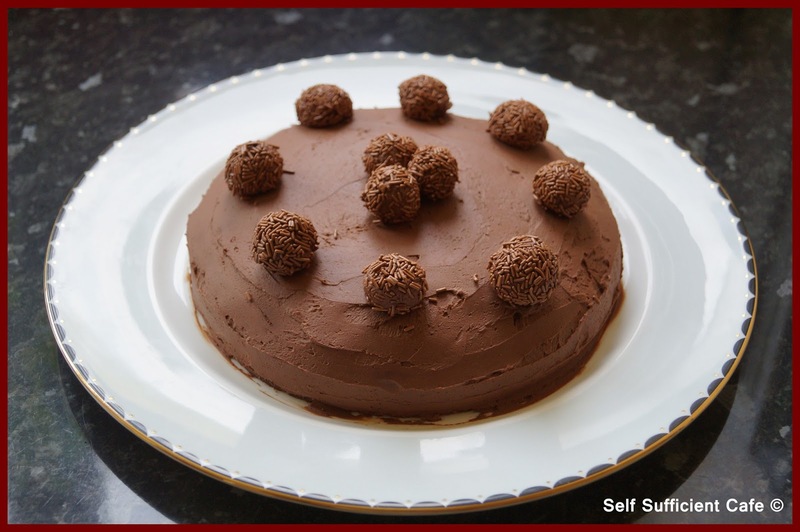 After checking my cupboards for the ingredients, I soon realised that to make her recipe would have been impossible, I had no soy, rice, coconut or almond milk! But what I did find lurking in my cupboards was a packet of vegan cheese sauce powder,which I bought when I first tried veganism 3 years ago! 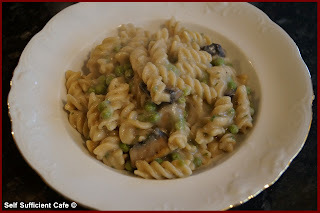 My mind was set on mushroom pasta, so I boiled up some wholewheat pasta and made up some cheese sauce according to the instructions on the packet, which just required water. But I also added garlic granules, nutritional yeast and parsley to the sauce, as per Maple Spice recipe. I also added some garlic puree to the sauce too for that extra garlicky loveliness. 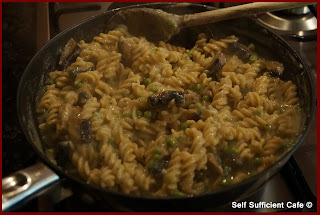 Meanwhile I fried 2 field mushrooms in a little vitalite and once cooked added some cooked frozen peas. 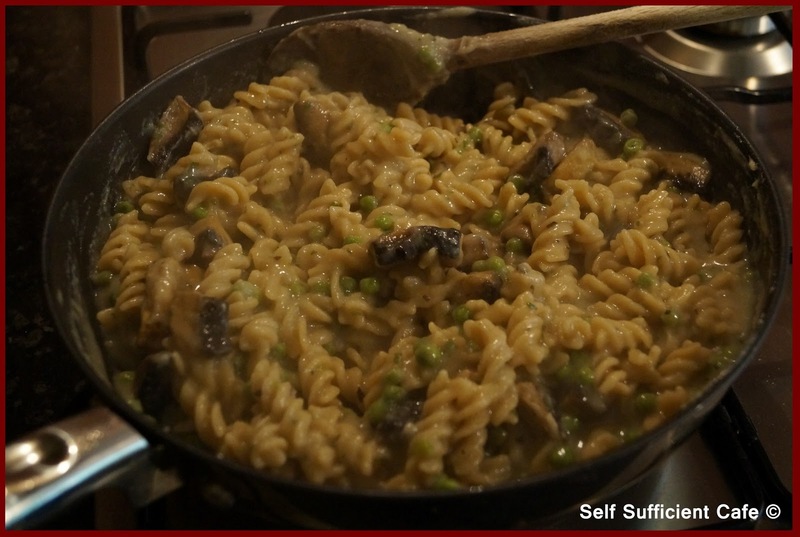 Once the pasta was cooked I added to the mushrooms and poured over the cheese sauce. The cheese sauce was extremely thick (even though I added the recommended amount of water) so I also added about half of the pasta water to loosen everything up. The verdict: it wasn't the greatest cheese sauce in the world but the added parsley and garlic made it edible! As soon as I've been shopping I will try the recipe of Maple Spice, because it does look so tasty. I used all of my remaining strawberries yesterday so I had to use something else in my cold sore busting smoothie today. After doing a little more research I found that pineapple is an excellent source of vitamin C and manganese. It is also a good source of vitamin B1, vitamin B6, folate, copper and dietary fiber. So I replaced the strawberries and apple with half a pineapple, the result; it looked the same but tasted a little sweeter and I preferred it. Not that long ago I would have cringed at the thought of including vegetables and tofu in my smoothies, but its amazing how your taste buds change over time. I don't bat an eyelid these days. Cold sores; the good, the bad and the ugly! Yep cold sores are all those things bar 'the good'! It seems my run of bad luck in the health department is ongoing, I now have a bottom lip full of cold sores! Yep it hurts to talk, eat and drink and I'm really starting to feel very sorry for myself now! My research also informed me that I should also be nourishing my skin with essential nutrients to help ward off the cold sores. It is recommended that you ensure you are getting plenty of zinc, vitamin C and bioflavonoids. These will help you protect, nourish and strengthen your skin. Apparently zinc is not found in large amounts in plant foods, but the best, common plant sources of zinc are legumes, nuts, seeds, and oatmeal. Which if I believe the research I've undertaken so far are mainly foods to avoid because they also contain arginine. However, legumes aren't listed as an arginine food so I figured they need to make a larger appearance in my diet. Bioflavonoids, are also sometimes referred to as “Vitamin P,” and they are super-antioxidants found in many natural foods. Apparently bioflavonoids are found in many of the same foods that contain vitamin C, which is good news for me. So I now knew what foods I should be eating and what I should be avoiding, the dilemma was to cook something up with food I had at home as the last thing I felt like doing was going shopping! To top things off, hubby is in bed with a chest infection and cold, so he didn't feel like shopping either. 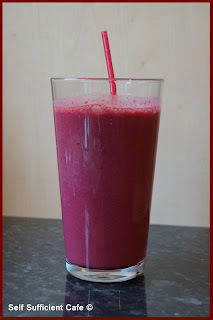 Because its easy to drink through a straw at the moment I decided the first thing I would do is whip up a cold sore beating smoothie. 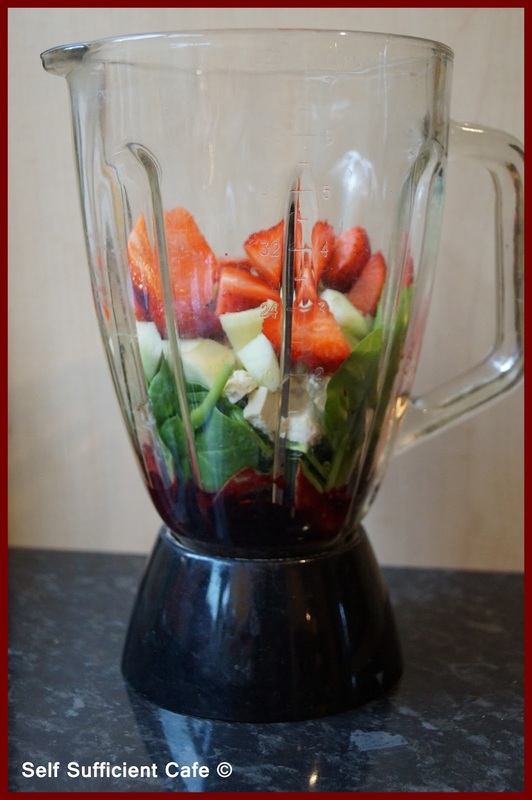 Add all ingredients to the blender in the order above and blend until smooth. Easy! 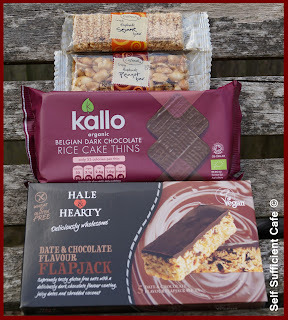 A week ago I told you about the amazing goodies that I received from Lucy the Vegan in the May vegan swap box. I had been partnered up with Dan who works for People for the Ethical Treatment of Animals (PETA). PETA is a well worthy charity, infact I don't know why I'm not a member already. But this has been resolved and I am now a fully fledged member and my donation is already doing some good to help protect animals. Please check out their website it is full of information some which you may find distressing, but we can't close our eyes to what is happening, we need to help PETA put a stop to what happens to our fellow creatures. 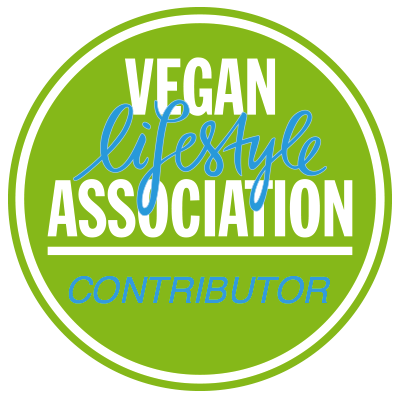 PETA have a free vegan starter kit too which I downloaded, it is full of useful information and gives you links to some tasty recipes. You can also find some tasty recipes here, just click on the recipe tab and it will give you a list of all the dishes I have posted. 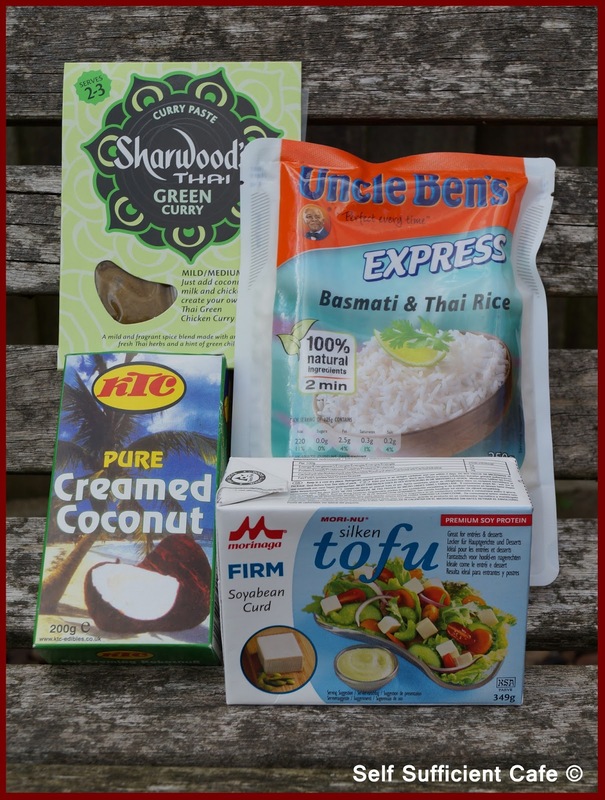 Now, I can imagine Dan is extremely busy and sometimes the last thing you want to do when you get home is cook up a feast so I thought I would add some ingredients to his vegan swap box so that he can rustle up a tasty vegan meal in no time at all. 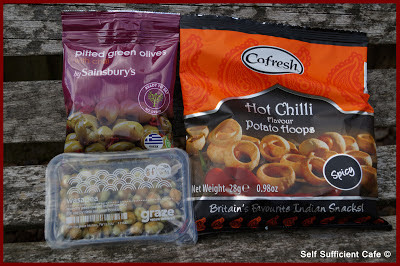 I also included some sweet and savoury snacks that Dan can keep at work for those times when you just need a little something. And to round it off I included some chocolate. I hope Dan likes my vegan swap box, I enjoyed putting it together. I saw the Thai Green Curry Paste in Sainsbury's and I bought some for myself too, which I haven't used yet but will do soon. 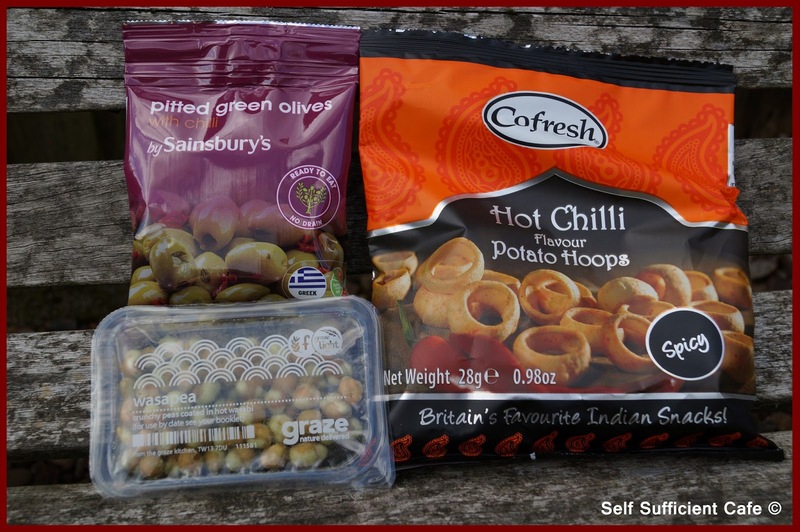 I don't think you can go wrong with having some olives to hand, they are a delicious healthy snack, but I think you either love or hate them and I hope Dan is an olive lover! I normally include a Graze box with my swap but this time I decided against it and instead I just added one packet from my latest Graze box, wasapea. 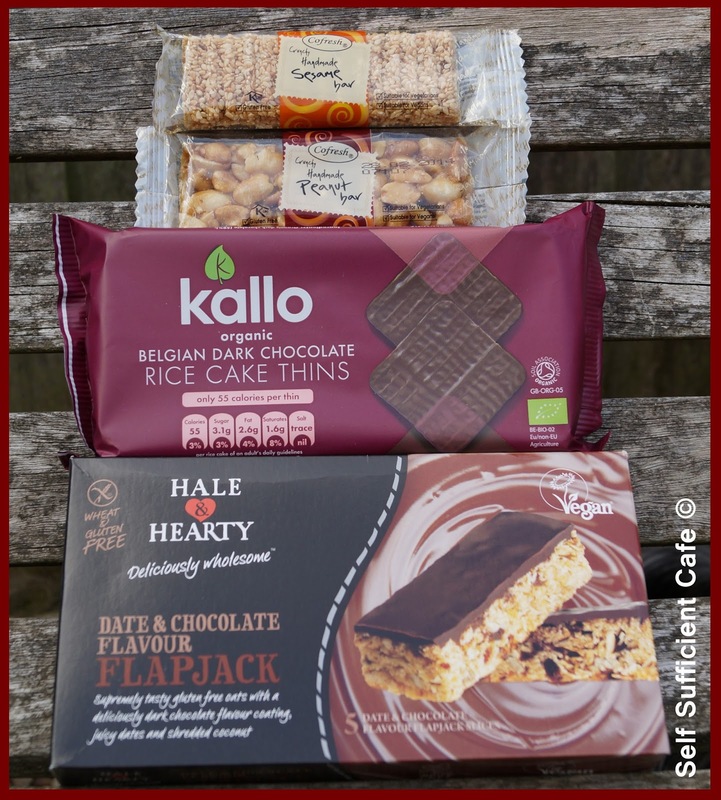 My favourite treat at the moment is the Hale and Hearty Deliciously Wholesome Date and Chocolate Flapjack. It really is delicious and I can't get enough of them at the moment. They are a little on the expensive side but so worth it. The Belgian Chocolate Rice Cake Thins were provided in a previous swap box I received and they are now a staple food cupboard item in our household. 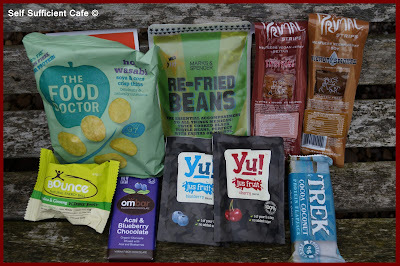 To see what I received from Lucy the Vegan check out this post. Ill again . . . . . Some say I'm having a run of bad luck and I'm starting to agree with them. After my nasty stomach bug and falling from a style I now have a horrid chest infection! Please bare with me, I don't think I'll be posting anything for the next few days, whilst I recover. It took me 3 days to get to the doctors I felt that ill and now I'm on antibiotics. Today is the first day that I've felt half human. Thank 'googleness' for post scheduling, I cooked, photographed and wrote up a batch of posts last weekend of food that I was going to have this week. Unfortunately I didn't eat any of them, my diet has consisted of water, water and more water with a little bit of toast every now and then. My little (well not so little) friend, Marco has kept me company and has stayed by my side throughout, he's been absolutely adorable. He knew I was ill and has been rather subdued himself. 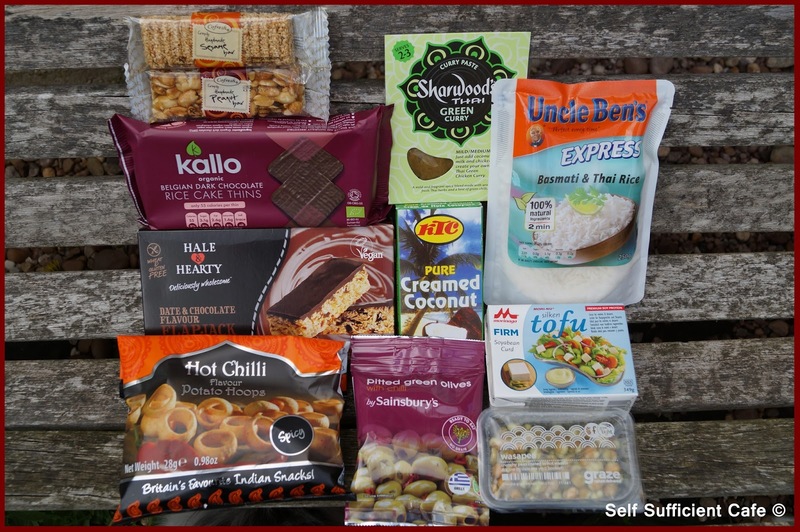 Apologies, I'm late in sending my vegan food swap box but hopefully it will be in the post today and my swapper will receive it early next week. I've kept Dan at PETA informed and he has been sympathetic. Dan, you will receive it soon, I promise! I'm off work next week so I'm hoping a full rest and relaxation will get me back fighting fit. I'm hoping to get in the kitchen to and try out a few new recipes, but I'm not going to overdo it. I will post what I cook up though. 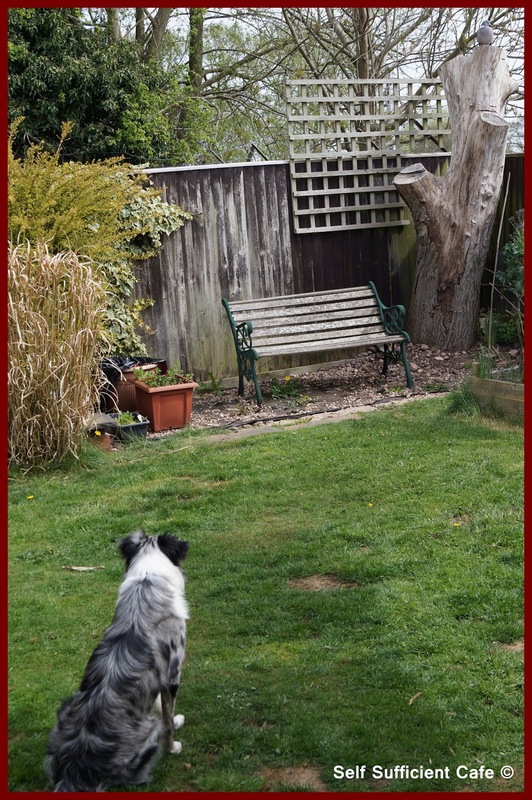 I hope you all have a fabulous bank holiday and fill it with exciting things, the good news is it's going to be sunny! Tonight I was feeling totally different to last night and there was no way a simple salad was going to fit the bill tonight. 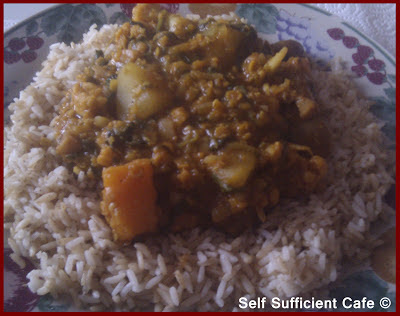 I was craving something spicy, which wouldn't take long to cook, curry was the ideal meal. Unfortunately I hadn't any fresh chillis or ginger so I had to use dried, but it didn't effect the flavour at all. I've been put off in the past from not using fresh chillis and ginger in my homemade curries, I'm not sure why though. But tonight has changed my thinking and no longer will I shy away from using dried ginger in a curry rather than in just cakes! Thinly slice the onions and saute in a little olive oil over a low heat for about 10-15 minutes. Add the garlic and saute for another two minutes. 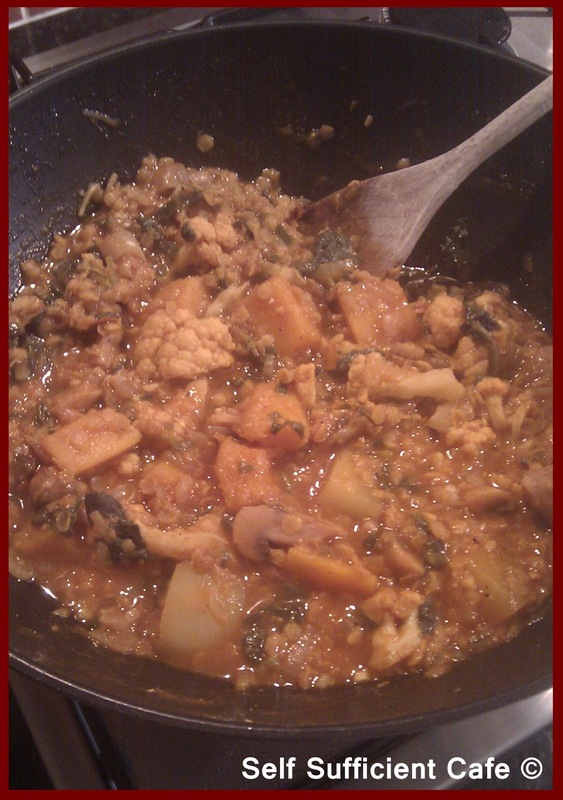 Add the dried ginger, crushed dried chillis, curry powder and tomato puree and stir through the onions. Add the butternut squash, potato, mushrooms and cauliflower and coat with the onion paste. Add the lentils, bay leaf and water and bring to the boil. Reduce the heat and simmer for 15 minutes or until the vegetables are al dente then add the shredded spinach and cook for two more minutes until wilted. Add salt and pepper to taste and serve over rice. Today, all I fancied was a salad, although I was starving hungry, so it needed to pack some calories. I raided my fridge and through together some salad leaves, tomatoes, cucumber, spring onions, beetroot, avocado, houmous and falafels. I then dressed the salad with a squirt of garlic vegan mayonnaise and salt and pepper. It was heavenly, sometimes the most simple things in life are the best. 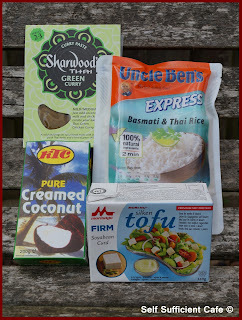 I can't believe that its time for another vegan food swap box, it comes around so quickly, which isn't a bad thing as I'm always excited to see what I will receive and I love putting together a box for a total stranger. If you've never heard of this before it's something that To Happy Vegans organise and every month you are assigned a partner to send a parcel of vegan goodies to and in return you receive your own parcel of surprise delights! As you can see it was a real parcel of goodies, so far I've tried the hot wasabi soya and corn crisp thins, which were very hot indeed! I didn't eat them all in one sitting they were that hot! Even hubby thought they were hot and he eats vindaloo curries. The wasabi really does catch the back of your nose when you eat them, but that's not to say that I didn't like them, I did. 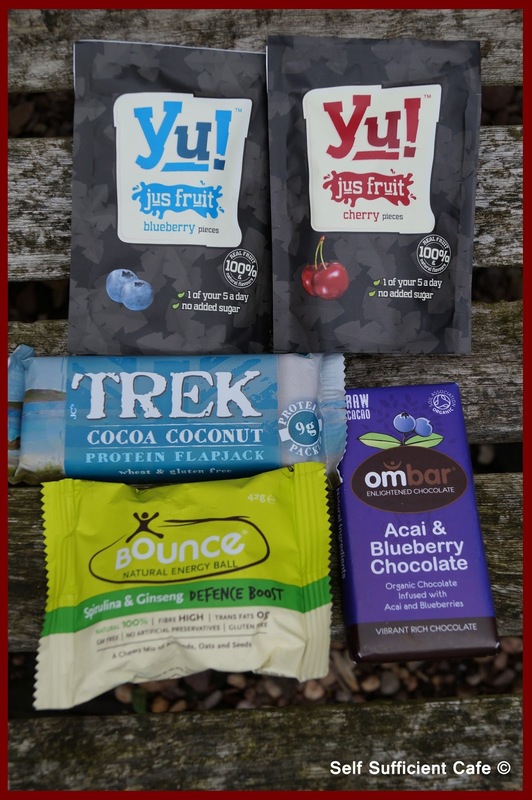 I've also tried the Ombar which was delicious, I could really taste the blueberries, vegan chocolate as it contains no milk can be very bitter, but this was quite the opposite and very sweet, mmmmm delicious. Lucy has sent me a box full of goodies that not only haven't I tried before but I've never seen before and I can't wait to try everything else in the parcel. I'm thinking something Mexican for tea so I can use the refried beans. Thanks Lucy I loved your swap box, I hope you received a fantastic one too. Yesterday I told you about the buffet we had last bank holiday and the dishes that I made, but I forgot to post the Thai coleslaw recipe, which was amazing. 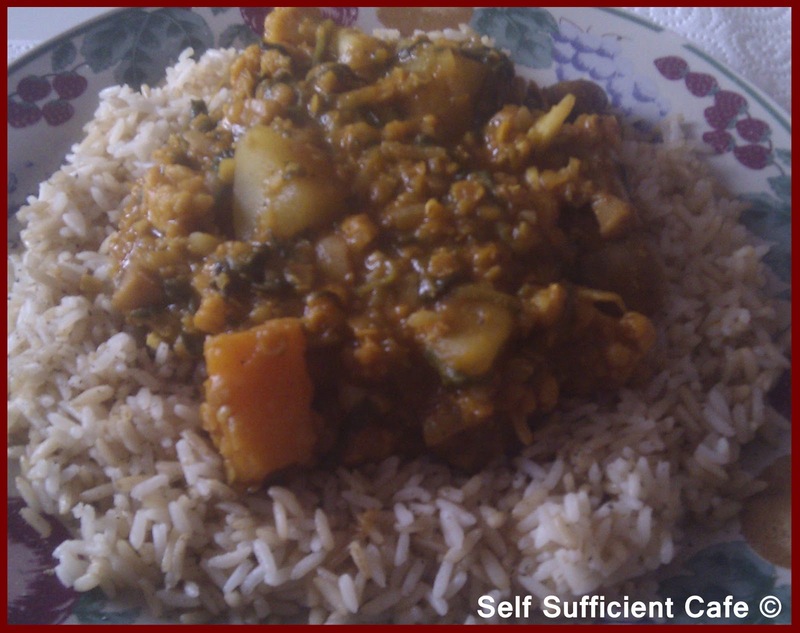 The recipe was published in a Tesco magazine which you get free at the check out and I've changed the ingredients to make it vegan and to use vegetables that I already had. 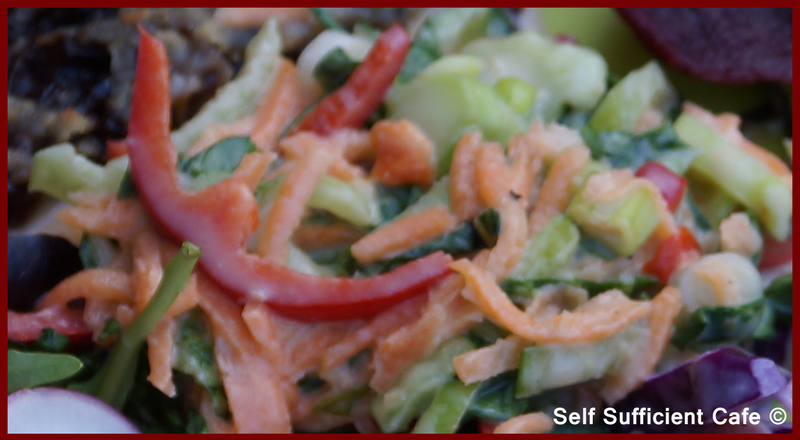 Finely slice the bok choy, red pepper and spring onions, and grate the carrot. 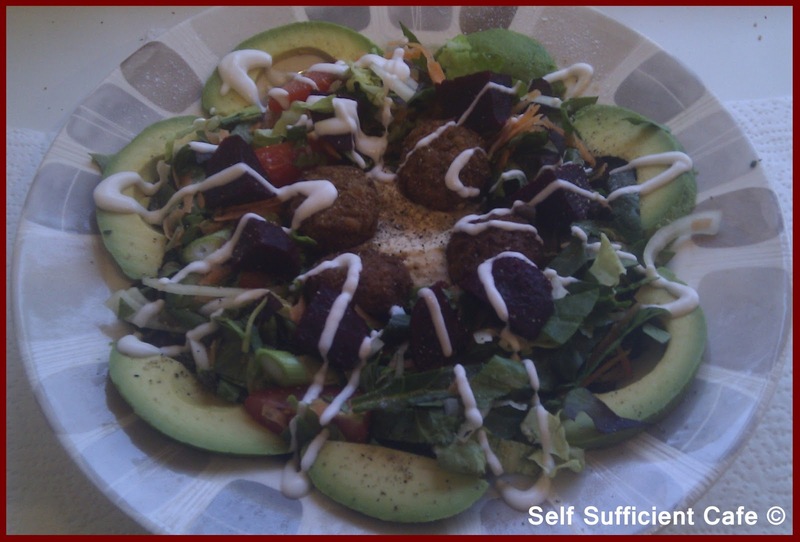 Add to a bowl big enough to enable you to mix everything with the dressing. To make the dressing add the coconut milk, vegan mayonnaise and sweet chilli dipping sauce to another bowl and whisk until combined. Add the lime juice and salt and pepper and whisk again. Pour over the vegetables and mix so that all vegetables are coated. If the mixture is a little dry add more coconut milk. I think this would make a lovely filling for lettuce wraps, just add a spoonful near to the edge of a lettuce leaf (iceberg would work well) and fold the left and right edges in and roll. Easy to eat to especially if you haven't got a fork and knife! Send me your photo captions! Its been ages since I last posted! Two weeks to be precise, but a lot has happened and blogging had to take a back seat whilst I dealt with other priorities. It hasn't been the most pleasant two weeks, I've had a horrid stomache bug, had a nasty accident where I fell from a style onto my head (I have the cuts and bruisers to prove it- ouch!) and been worrying about three other family members who are not well either! But I'm pleased to report that things are getting back to normal and family are on the road to recovery and my bruises are turning from black and blue to a yellow tinge. With everything going on I haven't really been in the kitchen much too, I didn't eat anything for almost two days with my stomache bug, which is one reason I think I fell from the style. To top it off the weather has been pants too hasn't it and the weekend we went away camping it absolutely threw it down and we had thunder and lightening, which poor Marco didn't like at all. His first camping trip was one disaster after another. I just hope it hasn't put him off altogether. 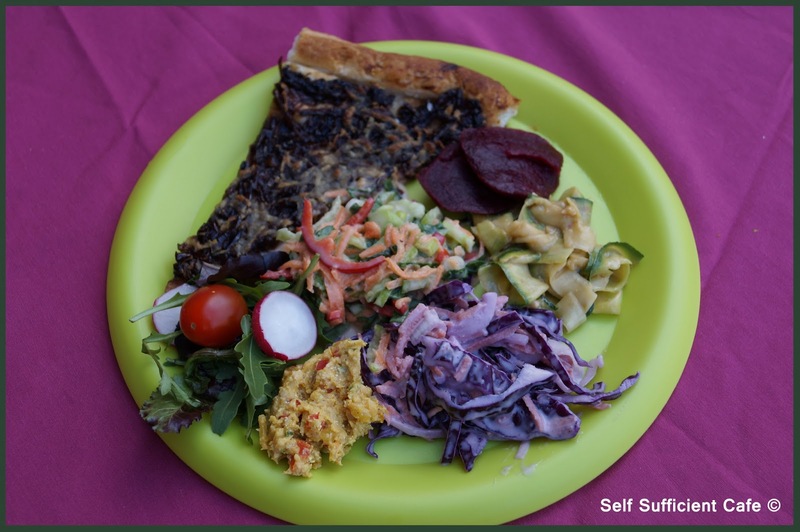 My recipe for coleslaw can be found on this blog, but this time I used red cabbage as that's what I had in my fridge. The Thai coleslaw was veganised from a recipe in a free supermarket magazine and the curried chick peas and satay courgette ribbons were adapted from recipes posted by fat free vegan, called zucchini 'noodles' with sesame peanut sauce and two chickpea salads. 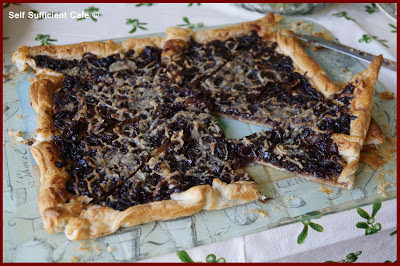 The red onion caramelised tart was easy to make. All I did was saute 2 red onions and 2 brown onions in a little olive oil over a low heat for about 15 minutes, then I added brown sugar and balsamic vinegar and cooked for another 10 minutes. Top a sheet of already rolled puff pastry (jus roll is vegan) with the mixture and sprinkle a little vegan cheese on top and bake in the oven for 15 minutes. It was delicious and so easy to make. 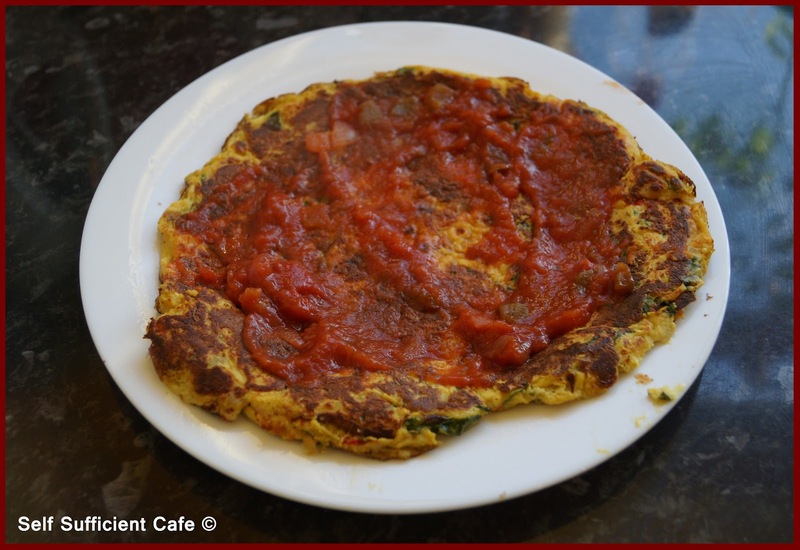 Carrying on my theme of cooking with the top five nutritional vegetables, I decided a tofumlette was the perfect breakfast this morning. This looks a bit like an omelette but uses tofu instead of eggs, hence the name. I needed something substantial as hubby and I had decided, as the weather was nice we would clear out the garage. This has needed doing for some time and I'm happy to report it is done! The car is loaded to the brim with stuff to take to the tip, mainly old boxes and cardboard! Now the garage is clear, we intend to keep it that way! I wonder how long that will last. This recipe makes three good size tofumlettes, after making one two this morning I stored the remainder of the mixture in a beaker in the fridge, ready to go for another morning. First of all blend the ingredients for the tofumlette. 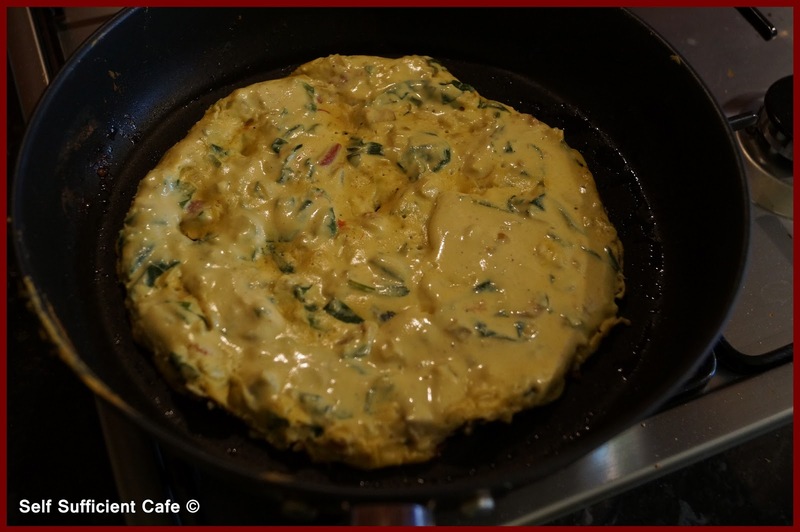 Break up the tofu into a food processor I use, Cauldron Original Tofu and add the soy milk, gram flour, nutritional yeast, arrowroot, garlic, tumeric, salt & pepper and blend until smooth, until the mixture is thick like yoghurt. Pour into a jug or spouted bowl. Finely chop the red pepper and mushrooms and finely shred the spinach and add to the mixture, stir to combine thoroughly. Get your frying pan really hot and add a little olive oil, I used a kitchen towel to wipe the oil over the bottom of the pan. When the pan is smoking hot add 2-3 ladles of the mixture and smooth out, so the mixture is even. Leave to cook, try hard not to prod and poke it, otherwise you will end up with scrambled tofu instead. I'm speaking from experience the first one I did ended up just like that, hence the second photograph is a different shaped tofumlette to the first! After about 3 minutes take a sneaky peak and if the edges are starting to brown and the the top looks almost set, quickly flip, patching up if needed! Squash it down with a spatula and cook for a further 2 minutes. Slide onto a plate and spread tomato salsa over the top if desired. Three weeks ago I blogged about the top 5 nutritionally-dense vegetables, which are broccoli, cabbage, spinach, leeks and kale. I've shared a few of my recipes on this blog which showcase these veg, the last being earlier this week; Kale Chips! I've been feeling very drained lately, I'm always tired and I have no reason why this is. I know I have had a lot on my plate with the majority of my family being poorly, and being extremely busy at work, but I have been looking after myself! 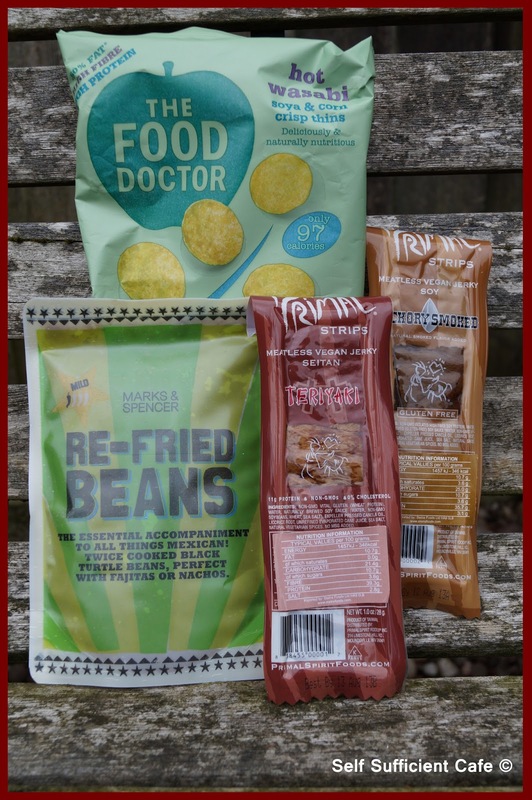 OK maybe I've eaten too many vegan crisps! So today I'm turning a new leaf and trying to eat fresh and not processed foods. Today it felt like Spring had finally arrived and I even put a pair of sandals on for work, bearing my toes, which have been kept hidden away for what feels like ages! Even though the weather was warmer I fancied soup and I felt like it needed to include some of the op 5 nutritionally-dense vegetables to help with my tiredness. 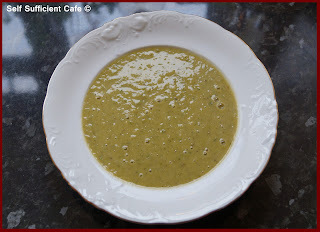 I made up a batch of leek, kale and butterbean soup which is a take on leek and potato soup without the potatoes! Finely shred the leeks and saute in the olive oil with the bay leaf and thyme until the leeks are very soft, about 10 minutes. Next add in the finely chopped garlic and saute for a further minute being careful not to let the garlic burn. Pour in the stock and add the butterbeans, oregano and parsley and bring to a simmer. Add the salt and pepper to taste and add the shredded kale and cook for around 15 minutes. Remove from the heat and let cool for a while, before transferring to a food processor to blend. Transfer the blended soup to a clean pan and gently reheat before serving. I enjoyed mine with a lump of crusty bread, delicious.